It’s summerrrrrtimmeeee. Let’s celebrate with all the fruit crisp, shall we? Lately my Saturdays have consisted of a trip the farmers market wherein I grab all of the leafy greens, seedy bread and fruit I can find. Then, I stumble home and try to think of ways to consume all of said food. This crisp is one of those ways. This recipe requires just 10 ingredients and is inspired by my new-found love for peaches. 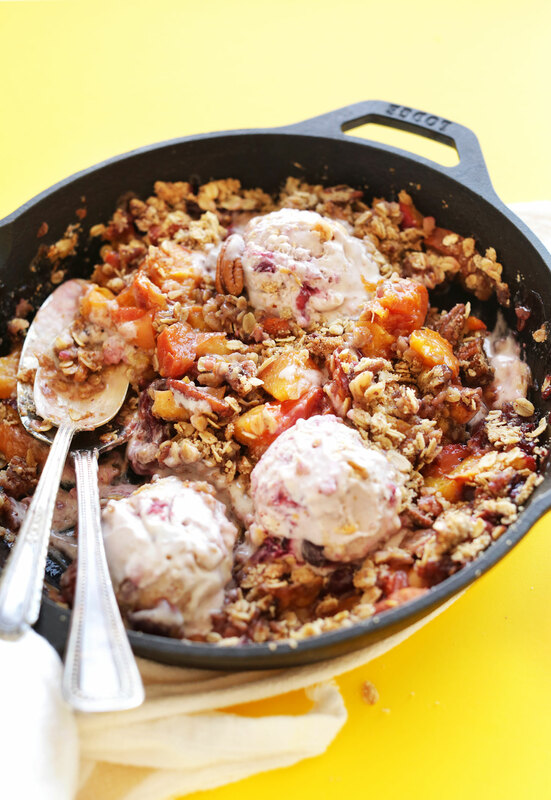 I used my Nectarine Strawberry Crisp as inspiration, but this version is butter-free and has very little added sugar. It also includes some gluten-free flour to give the topping extra texture. I love how the fruit gets all caramelized and bubbly while the topping turns crisp and deep golden brown while baking. This dessert is delicious on its own, but I prefer it with some dairy-free ice cream. I opted for my Vegan Cherry Pie Ice Cream and it didn’t disappoint, but pretty much any flavor will do! If you give this crisp a try, let us know! Leave a comment and rate it, and don’t forget to take a picture and tag it #minimalistbaker on Instagram. We’d love to see what you come up with. Cheers! 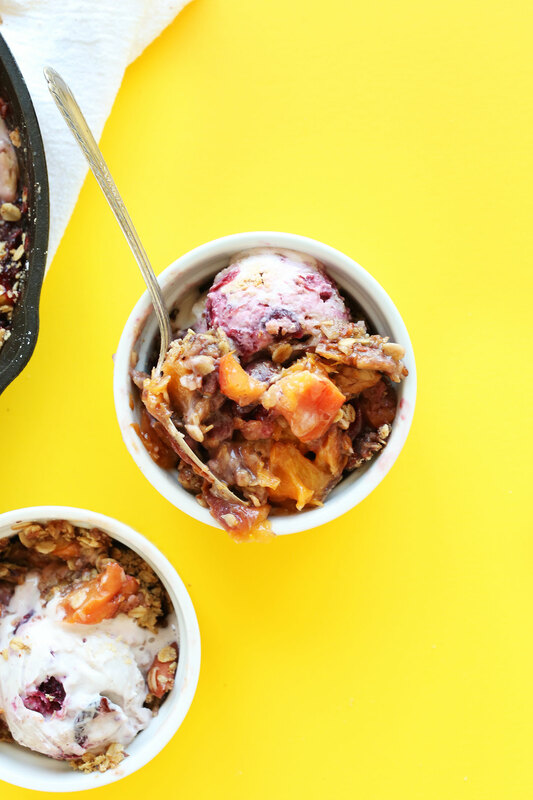 Simple, 10-ingredient Peach Crisp that's naturally vegan and gluten-free! Butter-free, simple methods and so delicious with dairy-free ice cream! Preheat oven to 350 degrees F ( 176 C) and lightly coat an 8x8 (or similar size // adjust number/size of pan if altering batch size) baking dish with coconut or olive oil. Add fruit directly to the dish as you chop it and spread flat. To a mixing bowl add crumble ingredients (including oil) and, using your hands or a wooden spoon, mix until all everything is evenly distributed. Add to the top of the fruit in an even layer and bake for 40-45 minutes, or until the fruit is bubbling and the top is crisp and golden. Serve as is, or with dairy-free ice cream, such as Raspberry Ripple or Cherry Pie! Best when fresh, though leftovers keep for 2-3 days covered in the refrigerator. Thanks for the recipe. Do you remove the skin from the peaches or leave it on? You can leave the skin on! Any suggestions to sub for the almond meal? I made this recipe with fresh Georgia peaches and it turned out perfectly. The guests at our dinner party loved it! Thank you for the wonderful recipe. Pretty good! Used 1/2 all-purpose gf flour blend from Bob’s Red Mill and 1/2 teff flour with coconut oil plus 1 t cinnamon and dash of vanilla. The crumble topping never got very crisp unfortunately even after cooking for 50 minutes, but flavor was good. I didn’t find it dry like other reviewers though – it did clump together nicely. I also added a handful of blueberries. If fruit is sweet and at peak of ripeness, could get away with less sugar in the crisp. Thanks for the recipe! Hi! I’m wondering if you could sub half the fruit for blueberries and do a peach-blueb combo? Do you think it would work/in what amounts? Thanks! That sounds like a great idea, Taylor! Another reader in a comment above used blueberries and I think half and half would work nicely. This turned out beautifully! This will be my go-to crisp topping from now on – very easy to make and tasted delicious! I made some minor changes based on what I had on hand: added 1 tsp of cinnamon, used walnuts instead of pecans, organic unsalted butter instead of the oil and the extra 1/4 cup of almond flour instead of the GF flour blend. Everyone LOVED it! Do you think that this would work if I replaced sugar with liquid sweetener such as maple syrup or honey? Hi Nina! That should work, use 2/3 cup of maple syrup for every cup of granulated sugar! I made it and it was easy and delicious. Thank you for the recipe. Hi – I just made this and used coconut oil and it had a pretty awful after taste. I think I have to throw it out. :( Have you had that experience with coconut oil? Seriously. You have some darn good recipes. My landlord grows peaches and was nice enough to give us a bunch. I saw you had this tasty crisp recipe and immediately set to baking. An hour later…deliciousness! The crisp compliments the fruit so well. This is another keeper! I made this last week with peaches and coconut whipped cream and it was amazing, just made it tonight with cherries in place of peaches and put some dark chocolate chips in with the cherries and it was just as good. Thanks for the awesome recipe, so versatile! I just made this and it was amazing! I subbed out walnuts for the pecans since that is what I had on hand and added 1 cup of frozen wild blueberries and only used almond meal in place of gluten free flour. So very good! Will be making this again for sure. Hi Dana! So excited to make this! 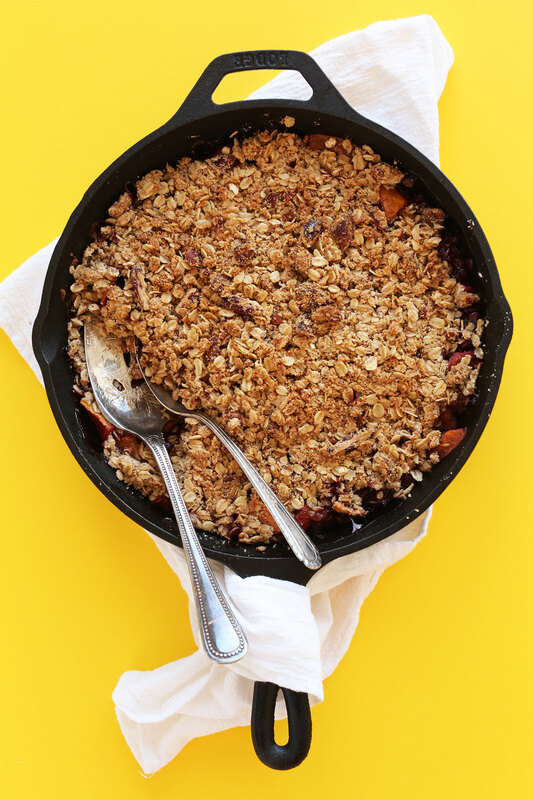 Did you use a cast iron skillet when baking the crisp? Hi Chandler! That was just for the photos, but we baked ours in a baking dish as per the instructions! Hope this helps! Hi! I’m planning on making this dish for a Kentucky Derby party this weekend. Could it be made in a slow cooker? Thanks for being such an inspiration! HI- How do you think frozen peaches would do in this recipe. I have a bunch from summer and want to try using them in this recipe, thoughts? Thank you! Love your website and enthusiasm! Hi! Thank you! Yep! Just thaw them. Could I use this recipe with coconut flour and get the same results? I have a daughter who also has a problem with almonds. I would also like to know if this could be made with coconut flour…. would it be 1:1? I’m an inexperienced baker. When i made this for my family i forgot to oil the pan and guessed a lot at different measurements. It was wildly simple to make came out entirely wonderful. My partner said he’d never had a better dessert. My friend said it both looked and smelled beautiful. Sitting around the table eating it together was a memorably happy moment. Comforting, delicious and joy-inducing. Thank you! I made this last night- Yum!!!! Relatively quickly to put together, with just the right amount of tangy, gooey flavor. I followed it almost to a T… am looking forward to it for breakfast and maybe lunch too. Who said sharing was caring? I’m going to share with myself. I made this for dessert for a summer time family dinner. Added blueberries, used coconut oil and put some extra coconut sugar in the fruit. Everyone loved it, thanks for the A+ recipe! Made this last night as part of my personal campaign to make the most of stone fruit season. I loved it. My husband loved it. It was full of flavor and yet not too sweet. Definitely going on my recipe repeat list. Thank you!! I got half price soft peaches and have just enough ingredients to make this recipe. Will black walnuts do OK in place of pecans, which I don’t have? Also, the recipe says nothing about peeling the peaches so I guess I do not, correct? This is the best crisp recipe we’ve ever tasted. The addition of almonds and pecans is brilliant. It is not overly sugary either. Love it! I wonder…is there something that could take the place of Almond meal? Peaches galore, but no Almond meal. Since it was so hot today, I baked this dish outside in a solar cooker. My son called it “freaking magical.” Thanks!!!!! I probably would have never tried to bake a crisp if my mum hadn’t brought me 4-5kg of fresh doughnut peaches from my parent’s fields in Cyprus. Question: what do I do with all these peaches?! Answer: I’ll just search “peach” on minimalist baker’s website! So, peach crisp and peach oat smoothies it was! This crisp is amazing, so flavourful and crispy and sweet! I served it for brunch (without ice cream) and it was a hit! I will try it again very soon with the other 4-5kg of apricots my mum brought! Thanks again Dana for all the great recipes! I am sorry but I don’t understand these instructions. What is in the filling and what is in the topping. It does not appear to be clear. I cannot stop eating this. It is amazing!! Sounds wonderful! How is this the next day? Does it get soggy? I’d like to make it the night before. Just made this tonight and it’s delicious! Thank you for sharing. (I ran out of almond & other flour so I put some cashew, chia seeds, flaxseeds, sesame seeds in blentec and used the mix with the oatmeal. It worked). Made this two weeks ago because the nectarines were on sale at the supermarket. I followed someone else’s advice and used the topping from the Apple Crisp using real butter (since I don’t follow a vegan diet) and it was AMAZING!!! Everyone loved it and I loved that it only used 1/3 cup of sugar (I used sucanat instead of brown sugar) and still tasted wonderful! Actually, it was sweet enough that I’m going to try to just use 1/4 cup of sugar next time. Thanks for sharing! Yay! Glad you liked it! Thanks for sharing, Alison. Minimal and perfect! I was surprised no spices are used. Multi-generational house and we all loved it. Why is it so easy to enjoy your recipes and photos! So great! Thanks for sharing, Dave! Excellent! It was a hit with the kids, of course. I didn’t have enough peaches so I filled in the rest with raspberries. Yum. Wow this looks incredible! I’m going to try it with plums so will let you know how I get on! Dana, I made this tonight for my family dinner. My mother and I are GF, and she is additionally Vegan. Everyone LOVED it! I made a double recipe (thank goodness-I have some leftover for tomorrow! ), and all with fresh peaches from my parents trees that are just starting to come in. I added the cherries and some home grown pears from my parents’ neighbors trees, as well as a touch of cinnamon. I used coconut oil for the pan and the crumble topping, which we loved, but I may use Vegan butter next time to see what the difference in taste is overall. I’m excited to see the recipe works with canned and frozen peaches. I’ll have a lot of one or the other from my parents trees…would love to make this for Thanksgiving as dessert! Yummy!! Looking forward to looking at the rest of the recipes here. Wow, what a timely inspiration!. We just came home to 8 gigantic overripe peaches which couldn’t wait till morning, so I whipped up your recipe & it’s amazing. I did make several substitutions: I added cinnamon to both topping & peaches, & to the fruit I also added: 2 tsp lemon juice, 2 tsp almond extract & 2 Tbs tapioca flour. Because I am still eliminating oats from my GF diet, I substituted quinoa flakes. Because I am trying to come as close as possible to eliminating sugar altogether, I tried something new which worked out great: I added a cup of fresh fig pulp to the topping ingredients, used coconut oil, used only almond flour & increased it to 3/4 cup, & dropped the sugar to 2 Tbs coconut sugar. That fig worked perfectly as a topping ingredient; I think it would have been okay to leave out the sugar altogether. I didn’t find it overpoweringly coconut-y at all. I did also bake it on Convection setting, which may have helped keep it from becoming mushy. I know that sounds like a whole new recipe, but it started with yours & I think it will hit that same sweet tooth, so thanks very much! A wonderful recipe! The almond meal and coconut oil and pecans are a perfect complement to fresh local peaches!! Thank you! I made this yesterday and was very happy with the results. I used whole wheat flour instead of AP flour, used 3 Tbs. of raw sugar (instead of 4 total), and added cinnamon to the crumble. YUM! I made this recipe yesterday using fresh Oklahoma peaches. The topping is delicious, and of course the baked peaches are as well, but I thought that the peach layer would have benefited from some other ingredients, like cornstarch and salt. That would prevent the thick layer of pure peach juice that winds up at the bottom of the pan. I think a slightly more sophisticated fruit layer would really take this recipe over the top! Thank you for the recipe! I gave it a try a couple of days ago but with apricots. My daughter doubted it would be incredible while looking at it in the oven but she actually just loved it! I’m not very convinced by the utility of the oil in the topping mix. Next time I’ll try with some vegan butter, maybe it will hold together quite better. Anyways, thanks for the recipe and for your whole blog that I just discovered. Greetings from Switzerland! Kids are coming and one is newly dairy free. I have gorgeous peaches which won’t wait for two weeks. Can I freeze them and use in this gorgeous recipe? I used canned peaches that I had received last Christmas from my grandparents garden. I had completely forgot about them until I saw this recipe. I made the entire crisp mix; my peaches measured out to be about 2 cups. Although next time I want to try two jars, I wanted to say if anyone considers canned peaches versus fresh, I can attest that it is still super delicious! I also reduced the baking time to about 20 minutes, or bubbling. Thank you for this (and all) of your recipes Dana! 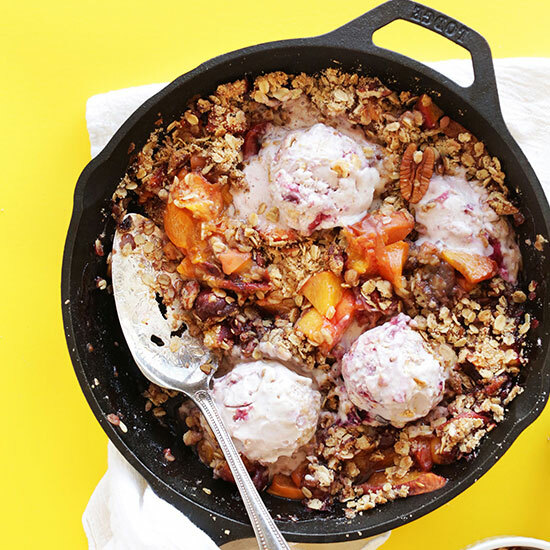 Can you make this recipe with frozen peaches instead of fresh ones? Ah, thanks for the question! I’ll clear that up. Hope you loved the crisp! Thanks SO much for this. We tried it with my family today, it was one of the most delicious desserts I’ve ever head :-) Extremely easy, quick, no fuss and tastes like Heaven on Earth <3 Amazing!!! Brava! Made this the other day and it was fantastic! My family and I devoured it!! Thank you for all your work!! So great! Glad you all enjoyed it, Rachel! This is too good to be true. I love cooked peaches. I grill them in the summertime, it`s the perfect barbeque dessert recipe! Love your photography! That’s the best way to eat peaches! Hope you love this version as well! Hmm, thanks for sharing Karen. Not sure what went wrong! 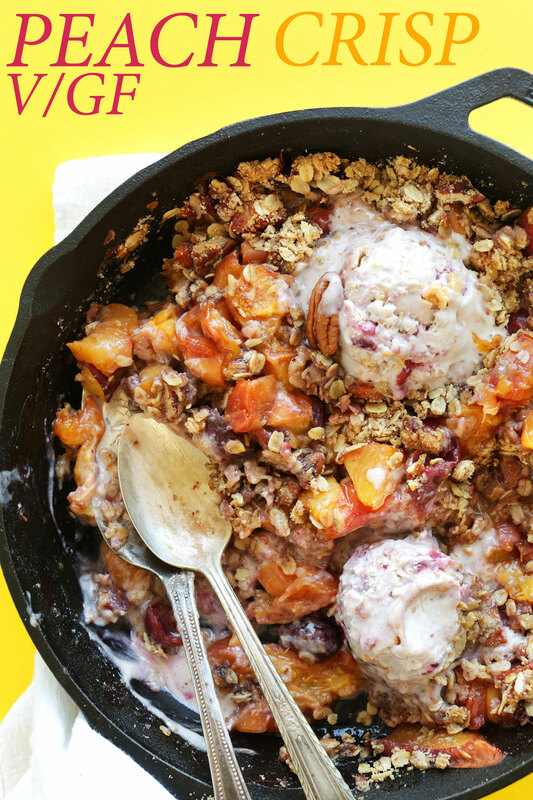 This peach crisp is seriously bursting off the screen!! Omg, YUM! I love any fruit crisp. It is my go to dessert in the summertime. Can’t wait to try your recipe! I love peaches. Beautiful! Peaches are one of my favourite Summer fruits, My Mum used to make things like this when I was a kid so I’m sure this would be amazing! 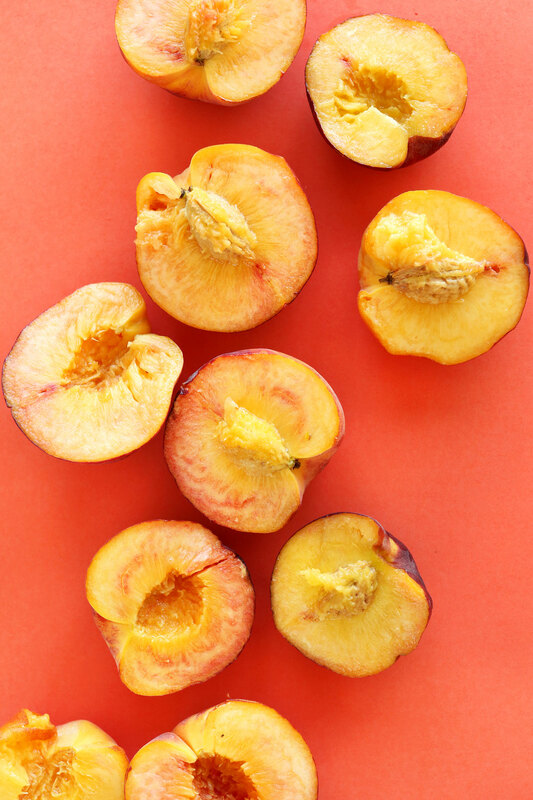 I adore the photos–peaches and nectarines are my absolute favorite fruits, hands down! OMG I am making this this week!! I was going to try to make a vegan peach pie but was dreading the inevitable debacle of handling pastry – this’ll be so much easier and satisfy all my summer peach cravings!!!!! Looking good! You’ve hit all my favorite desserts this week. I think what you are doing recently with your images is great and smart. They have become very recognizably you. I see that bright back-drop and I know I am looking at minimalist baker image. très intelligent! Sounds really good. Applesauce rather than the oil? Give it a try, but I don’t think that would work. What would you suggest then, rater than the oil? This looks and sounds so heavenly! The crumbly top, the cherry pie ice cream…. holy cow this is awesome! Great recipe! This looks incredible! I’ve been seeing lots of peaches at the farmer’s market lately and have been wanting to make something with them! Pinning this! Oh, yum! I am definitely a peach lover, and this looks delicious! Thanks for the sweet inspiration!